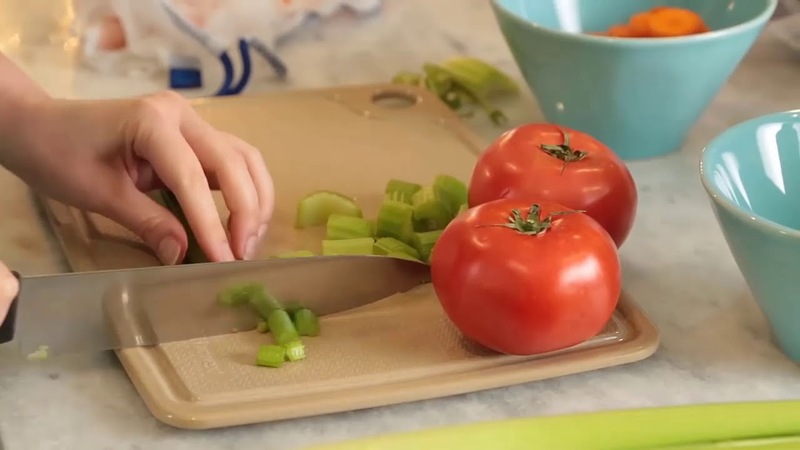 Help reduce plastics in the kitchen by ditching your plastic cutting board. Molded from natural Rice Husks, the Norwex Cutting Board is an essential kitchen tool! Made from biodegradable materials, it's easy to clean, and has an extremely durable composition to protect your counters from knife damage. It’s a great alternative to plastic cutting boards and features a food-grade silicone grip ring beneath the board to keep it in place while you safely cut and prepare your food. Large: 40 cm x 30 cm / 15.75" x 11.8"
Problem: You want to safely prepare your fruits, meats, and vegetables but plastic boards stain quickly, dull your knives and can be pierced and scuffed easily, allowing your board to potentially harbor dangerous bacteria. Standard wood boards are often difficult to maintain, and they can't go in the dishwasher. Solution: Reduce your plastic use and recycle your old, plastic cutting board—instead, use the Norwex Cutting Board and conveniently cut, chop, slice and dice your way to a delicious meal, every time! Helps to protect counters from knife damage.